Let’s Hop Over to Paris! As you all know by now, I love global perspectives so I’m always eager to present the life and style of fabulous bloggers from across the world. I also love hearing from readers from all over the globe, which always makes my day! I’ve been thrilled to find that my international readership is really exploding, so I must give a big thank you to all of the new international readers out there, as well as all of you existing subscribers. THANK YOU!! I also want to give a big WELCOME to all of the new readers in Singapore, Russia, India, Sweden, Brunei, and the UAE! Please stop by and say hello in the comments when you get a chance and thanks again for reading! 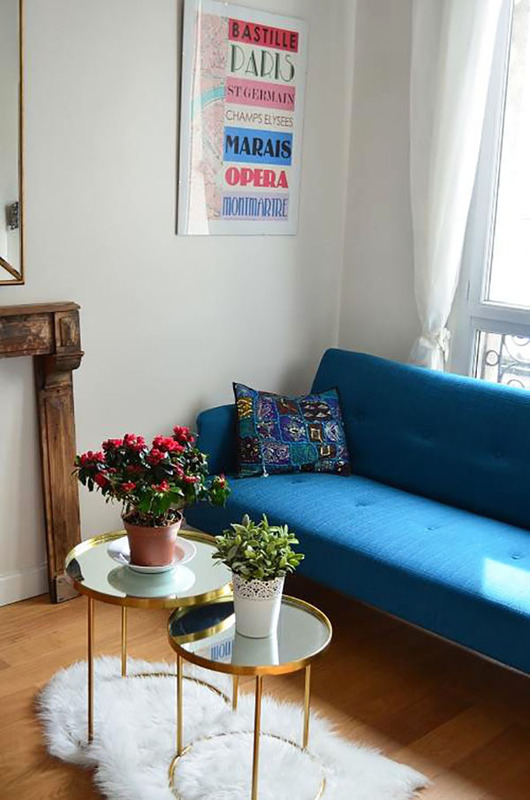 While we’re on the topic of international perspectives, let’s hop over to France and take a peek inside this chic-meets-vintage Parisienne apartment, home to blogger Naelle of Once in Paris. Jacquin: It’s so awesome that you’ve been living in Paris! What brought you to Paris and how long do you think you will stay? Naelle: I am both German and French, but I have been living in Paris since 2009 when I arrived for my final internship – and I never left. It is for me the most beautiful city in the world, there is so much to do and see, you have to live ten lives before leaving the city! I founded my blog Once, in Paris in November 2014 as I have been a fashion and design addict for years! I am a huge fan of vintage outfits and vintage decor, and since I bought my own apartment this year, I started to publish interior design articles on my blog too! Naelle: I love chic and elegant outfits that remind me of Parisienne women in the fifties and sixties. Heels are my mantra. 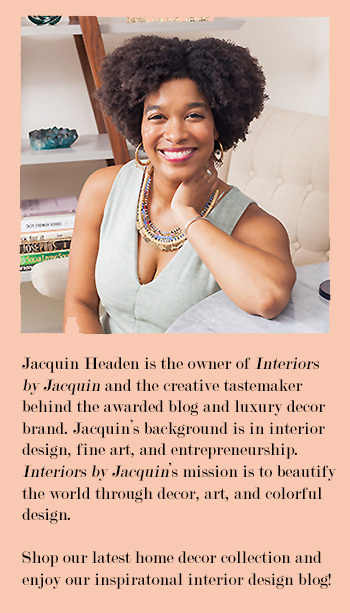 Jacquin: How did you decorate your space? Naelle: I wanted to combine antique pieces like a wooden fire place with vintage and scandinavian furniture. Decoration is like fashion, it has to fit your personality and style. I love when pieces seem to tell you a story and incarnate a particular decade! Naelle: My favorite space is my living room, which is why I thought it would be the perfect room to share today. It’s where I spend most of my time to read, or drink tea or a glass of wine with friends. My favorite piece? 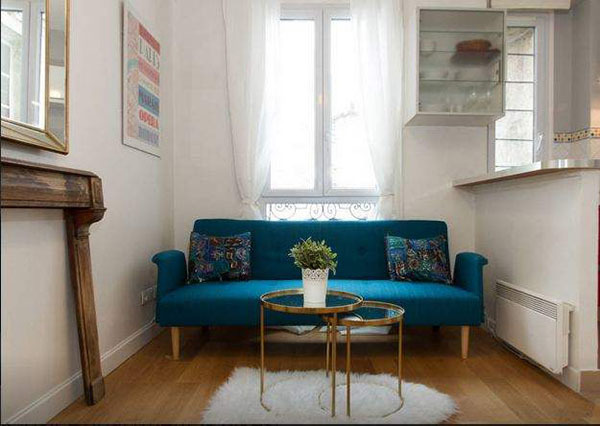 The teal scandianvian sofa, which I shopped via Drawer.fr. For me, a sofa is like a dress: The key is to remember, everything else is just an accessory. Jacquin: I must ask about your favorite places in Paris to store away for my next trip. What’s your favorite Paris boutique right now? What’s your favorite cafe or bar? Naelle: Gosh, there are so many boutiques that I love in Paris, it is hard to chose! ClaudiePierlot, Les petites…, and then all the Vintage Stores in the Marais… My favorite bar however is definitely Le Ciel de Paris: Located on the very last floor of the Montparnasse Tower, you have a much better view from there, than from the Eiffel Tower, but only a few people know it! Jacquin: What makes Paris unique and special to you? Naelle: Paris is the city of never ending surprises! Wherever you go, you will discover something new, something historical, something beautiful. History is everywhere – You can literally feel it – the presence of George Sand, Coco Chanel, Simonde de Beauvoir… Also, it is such an elegant city, where you are never overdressed.